On my first visit to Air Street it took me a while to realise that I was in the same venue that previously housed former ill-fated inhabitant Cocoon. Glossy sci-fiesque plastic furniture in whites and lurid oranges and reds have been replaced by a glorious art deco interior, a dark wood parquet floor, gleaming brass bar and half moon stained glass windows. Reclaimed school bench tables, replete with polished-over compass carved graffiti and aged, spotted mirrors add to the feeling that Air Street has been there, well, simply forever! Despite being prime time West End, this could be a very difficult location from an aesthetic perspective; a very long thing room with low ceilings that might easily feel oppressive, especially with all that wood panelling but its all been done exceptionally well. picture borrowed from Hawksmoor website! Clever and sophisticated interior design job aside, a lot has changed from the sometimes strange asian fusion offerings from Cocoon. 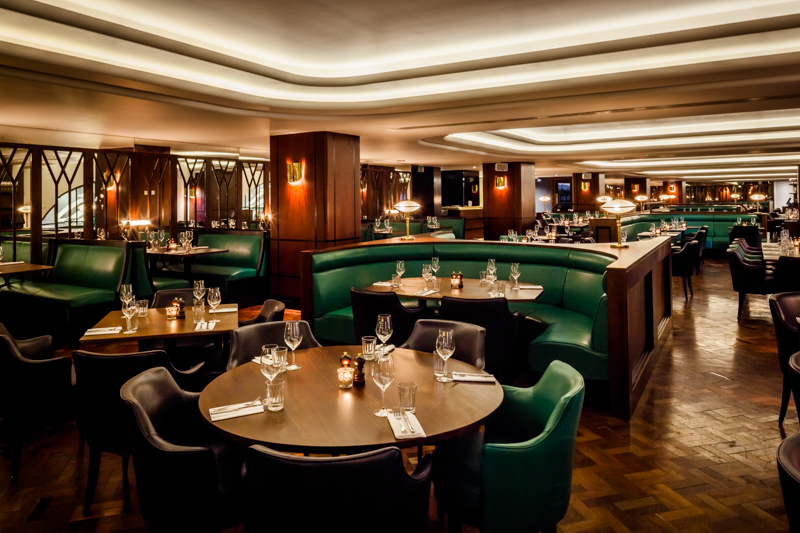 Hawksmoor are, of course, synonymous with excellent steak, however Air Street sees their first real foray into adding fish to the menu following input from Dartmouth based seafood guru, Mitch Tonks. Although scallops, dover sole and monkfish all sound delicious, I am here for the beef. I’ve been to Air Street a couple of times now with different groups of friends and never written about it. It was when a recent Sunday a lunch at Barbecoa in St Paul’s was aborted before it had even begun (boiling hot inside and horrifically loud dance music for a Sunday lunchtime or a table outside in the shopping centre- at those prices no thanks!) and my immediate instinct was to call Air Street and retreat to something reliable, that I knew I should write it up. On a Sunday a roast beef lunch is on offer for £19. Not the cheapest roast on the market but excellent value in my book. Rather than the traditional thin slices of beef, an inch thick chunk of beef is served. The meat is initially seared over charcoal before going into the oven to roast in order to try and replicate the old fashioned spit roasting of meat of yore. The plate is dominated by a giant Yorkshire pudding, crunchy on the outer with a soft doughy pillow as well as a roast garlic bulb releasing oozing, nutty garlic squish, roast shallot, carrots and greens. Horseradish sauce is a sinus-cleansing, zinger of a sauce but it is the sauce that really makes this plate sing. Onion and bone marrow gravy is a thick, sticky powerful concoction; sweet in part but deeply, deeply savoury coating your tongue with such a texture and flavour that makes you know that sauce took hours of reduction before it reached your table. Why is it that despite believing yourself to be utterly full you can aways find just a little bit of space left for something sweet? Its almost as if you have two appetites or two stomachs, one for sweet and one for savoury. The trick is to just say no when the dessert menu approaches but I can never take my own best advice and instead always say that I will just take “a little look” then before you know it, dessert has been ordered. A pretty, individual, round apple pie comes with the offer of pouring cream, clotted cream, ice cream or custard. I don’t think my father has ever had so many options and was briefly awed into uncharacteristic silence. 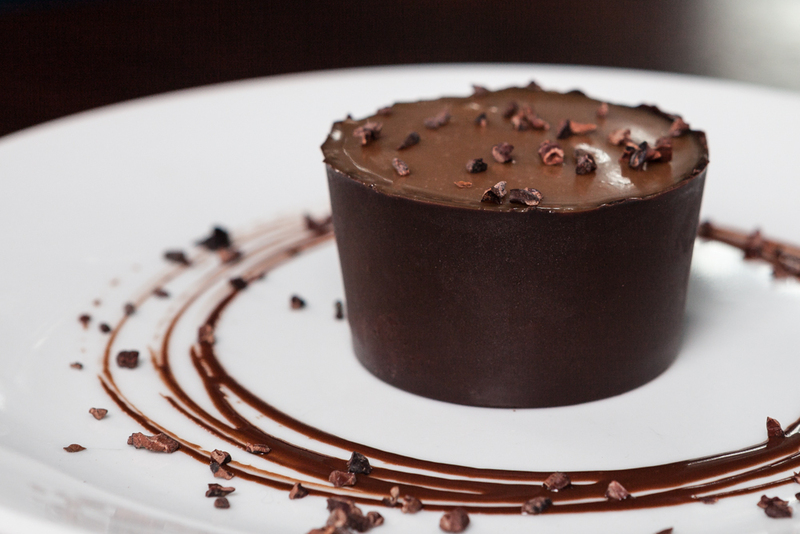 The salted caramel chocolate cup is essentially a giant salted Rolo. Rich beyond belief, it nearly had me floored but I couldn’t leave any of the wonderful salted caramel topping beyond so I soldiered on. Lemon and mint sorbet was refreshing with an excellent tart vs sweet balance and would have been a much more sensible dessert to go for than my chocolate caramel whopper. The wine list is just as good as the other Hawksmoors. A 1999 Urbino Crianza Rioja is a little bit of a luxury at around £48 but utterly delicious and well rounded sliding down altogether too easily for a Sunday afternoon. A more reasonably priced Montepulciano at £22 is a perfectly good accompaniment to a a Sunday roast; fruity and quite light but with the oomph to stand up to the beef. The cocktail list is broad and interesting and I will definitely be going back to Air Street just for drinks. I think that Air Street has the potential to become my favourite of the Hawksmoor family. In part this is down to the location but also the decor, I can imagine that with a summer of Gatsby mania approaching, I might not be the only one….